So this is it - with "The Name of the Doctor" we've closed out the last episode before the big 50th Anniversary special in November. After viewing the episode twice, talking to Jordan (my closest Who confidant), and reading fan forums and reviews of the episode (things I never do before writing a review, normally) I feel basically the same as I did right after watching the episode. Not a lot happened in this installment, but it felt big which was what I think I was ultimately looking for. Since showrunner Stephen Moffat has decided to step away from two-parters (though I'd make an argument for this being a quasi-first part to the 50th), he's insisted that the show become bigger, almost like a movie each week. I haven't got that feeling from any of the episodes this season. They've still felt like normal, stand-alone episodes of Doctor Who. This isn't a bad thing, it's just they don't feel grand or particularly cinematic even though the production value of the show has steadily risen each year since the show's return to television. But "The Name of the Doctor" did feel big. Maybe it was the return of the Great Intelligence, maybe it was the mystique surrounding the "name" of the Doctor, maybe it was an answer about our "impossible girl", maybe it was Strax or maybe it was the return of the deceased River Song. But in all likelihood, it felt big because it was a combination of all of these things, especially given the significance of Trenzalore and the Doctor's grave buried in a rapidly growing TARDIS an indeterminate number of years into the future. Normally I hate rehashing the plot because it feels like a waste of time since you've watched it (if you haven't, these things are kind of spoilery for someone who hasn't already watched) and I've watched it. Let's cut to the chase, I say. But this week it was pretty simple: The Doctor's friends are taken to Trenzalore because the Great Intelligence wants to get into the Doctor's tomb where he can scatter himself (itself?) all throughout the Doctor's timeline, undoing all of the good things he's done. Clara realizes how she could be the impossible girl - she must also scatter herself throughout the Doctor's timeline (clunkily, though amusingly depicted with Jenna Louise Coleman inserted into old episodes of the show with early regenerations of the Doctor running around). And that's basically it until the big reveal at the end with John Hurt's Doctor revealing himself inside the Doctor's time vortex"¦thingy. Before getting into what Hurt's Doctor is or means for the show, there's a lot to digest even though there isn't a ton of story in this one. First, the inclusion of Madame Vastra, Jenny and Strax continued to be a winning addition, though I found myself a little annoyed with Jenny this week. No matter, Strax's one-offs evened the balance quite well. The return of River made my heart grow three times its size (after a minor procedure, I'm fine) and offered a nice reunion, but an unsatisfactory end to the Doctor-River storyline if it truly is the end. The non-goodbye the Doctor gave her before jumping into his own timestream to save Clara and the fact we haven't seen River find out the Doctor's name or receive the red sonic screwdriver gives me hope that Alex Kingston's run on the show isn't over yet. This episode continues to show that "Forest of the Dead" and "Silence in the Library" are truly lynchpins to Moffat's run. I'd like to think Moffat would give Song a proper goodbye episode since she's his greatest creation. I found the answer to Clara's impossible-ness to be satisfying, even if I wasn't particularly satisfied with how Moffat handled it throughout the season. I could have easily watched Asylum of the Daleks and the Snowmen and then the finale and wouldn't have missed a beat in terms of story. I guess this is my way of stumping for more of an arc to the seasons. The precarious nature of Rory and Amy's relationship in series 5 and the precarious nature of their child in 6 were more or less intrinsic throughout their respective series. There was also the impossible astronaut and the crack in Amy's wall for additional fodder. In fact the latter two were probably more important plot-wise and the relationship stuff was obviously more for character, but in both cases, it added a significant amount more depth than there was this season. Other than her fantastic back-and-forth with the Doctor, I haven't had a lot to hold on to in regards to Clara's character. Perhaps with this business out of the way, series 8 will give us more to her, but it may be busy trying to give Smith a proper send off. Now to touch on Hurt, which I think was handled as well as it could be. Sure the title card "introducing" Hurt was a bit over the top, but it gave me goosebumps. The show is fully aware how big a deal this is and my lizard brain made me quake with excitement (not talking about the instinctive part of my brain, I have a literal lizard brain if you couldn't tell from reading my thoughts on Doctor Who). The theory floated that I tend to agree with for its juicy story potential is that Hurt's Doctor is an in-between regeneration falling between Doctors 8 and 9. We never see Christopher Eccleston become the Doctor in "Rose" and Moffat seems to be taking advantage of that. In revealing the true meaning behind the episode's tantalizing title, 11 points out to Clara that this Doctor is in fact one of his previous forms, but did not live up to the name of the Doctor (see what he did there?). 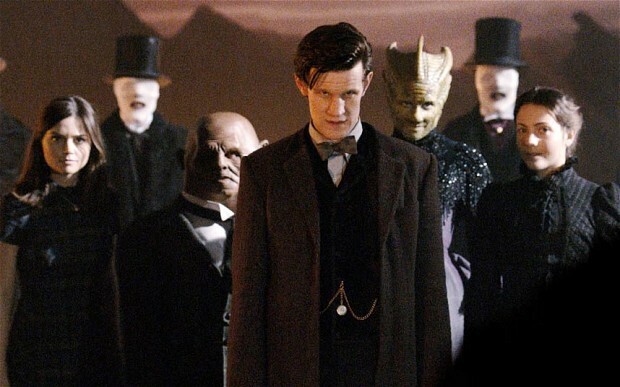 Having 10 and 11 confront this darker version of themselves could make for spectacular television and if this finale's job was to do nothing but tease me for the 50th, it was successful. But again, I think it ultimately proved to be what Moffat has been aiming to do all series, give us big, one-hour movies featuring the Doctor and Clara (and sometimes Amy and Rory and friends). This episode was powered by devotion to the characters and the show, not story. If it wasn't for Moffat (and Russel T. Davies before him) that may not have been possible. But as has been the case all season, Doctor Who never seems to mind if something seems impossible.